Successfully Added Portable DVD Player with Two 7 inch TFT Monitors 4:3 / 16:9 to your Shopping Cart. 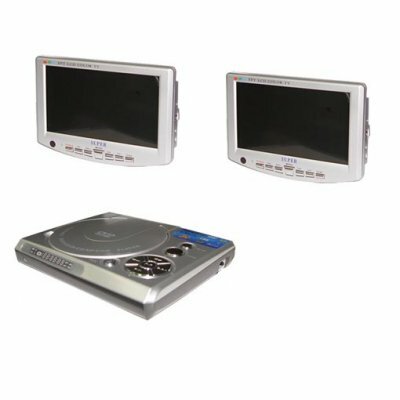 Car-portable region-free DVD player with two 7-inch monitors. A high performance and super value kit for car entertainment or other portable video applications. Very easy to set up and control. Playback of a wide range of formats including DivX video CDs. Plays MP3 CDs and DivX video CDs. 7-inch TFT, beautiful crisp image with good viewing angle range. Screen has earphone jack in the front. Screen has additional AV input jack at the front (e.g. for game console) and instant switching between AV1 and AV2. Using the remote control for the screen, you can flip the image vertically (e.g. if it is ceiling mounted) and change between different video aspect ratios. You can also select different menu languages. Screen has button controls on the front panel. The player, two monitors, and accessories are all packaged together in a retail box with a barcode. DVD player is top-loading type and supports a wide range of formats, with full menu control built in, e.g. for DVD language and subtitle selection, video settings, parental control, etc. Single item samples are available for delivery worldwide. Drop-shipping available to all members. Register free and log in to see the full wholesale price breaks and to preview shipping costs inside the online checkout process.